HAZIRA, India --- India’s first Armoured Systems Complex (ASC) in the private sector, developed by Larsen & Toubro, India’s leading technology, engineering, construction, manufacturing, defence and services conglomerate, was dedicated to the nation by Honourable Prime Minister Shri Narendra Modi, today. Honourable Defence Minister Nirmala Sitharaman was also present on this occasion. The Complex is currently executing the prestigious ‘K9 Vajra-T’ 155mm/52 calibre tracked, self-propelled howitzer guns program - the largest contract awarded to a private company by the Ministry of Defence, Government of India under the Make in India initiative through global competitive bidding. The ASC brings manufacturing of Armoured systems to Gujarat in accordance with the thrust areas articulated in the State’s new Aerospace and Defence Policy. L&T Defence has a significant presence in the state and manufactures Submarine Hulls and range of platform specific equipment and Subsystems, special alloys forgings for Defence applications at Hazira. It also makes critical composite subsystems for India’s Space Launch Vehicles and subsystems for BrahMos and Akash Missiles at the Advanced Composites Facility, Ranoli, Vadodara. 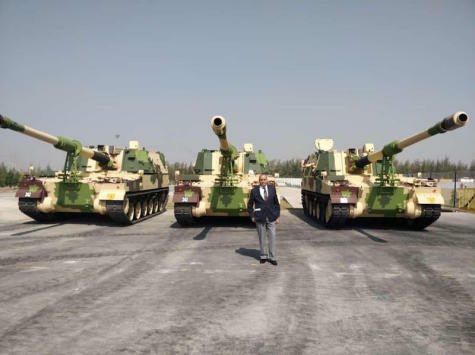 Mr. J D Patil, Senior EVP (Defence) and Member of the Board, L&T said, “L&T’s Armoured Systems Complex has already begun rolling out the prestigious ‘K-9 Vajra-T’ Howitzers ahead of schedule to the Indian Army. The Program embodies the spirit of the Government’s “Make in India” initiative by large scale indigenous production of various equipment and systems for cost efficient through life support, through in-house development as well as transfer of technology, and judicious mix of L&T’s in-house manufacturing facilities as well as tierised supply chain. The ‘K9 Vajra-T’ systems are being delivered with 50% indigenous content (by value) which includes 75% indigenous work packages at the Program level and involves local production of over 13,000 components per gun system through a supply chain of about 400 local Tier 1 manufacturers with over 100 from the MSME segment. L&T has put in sustained efforts and innovation in indigenising ‘K9 Vajra-T’, right from prototype built for user evaluation trials by indigenously developing fourteen critical systems, including the Fire Control System, Direct Fire System, and the Ammunition Handling System. L&T also developed the Auxiliary Power Packs, Air-conditioning Systems, Fire Fighting Systems, and NBC Protection Systems for phase 1 production units itself.